Cattaneo Commercial are pleased to announce the successful letting of Unit A, DST House to Barnard Marcus Estate Agents. 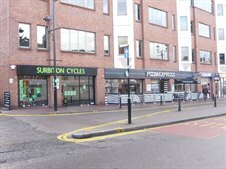 Occupier demand for Surbiton remains strong and consequently Cattaneo Commercial only have one remaining shop available in Surbiton located on Victoria Road next to Zizzi and opposite Sainsbury's. For further details please click here or alternatively call Adam Soliman on 020 8546 2166.